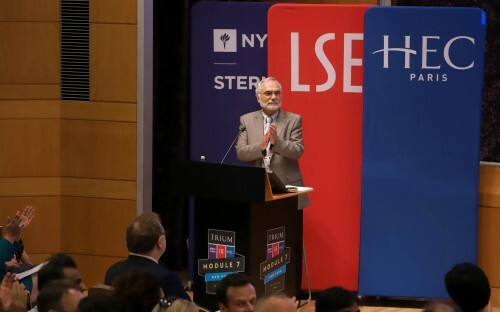 After speaking with an array of graduates from the TRIUM Global Executive MBA program—a joint program between the London School of Economics (LSE), NYU Stern, and HEC Paris—one thing is clear: they all have a yearning for lifelong learning. But, though the intensity and vigor of the program can ignite within oneself a passion for education and an ardent desire to never leave, there comes a time when the TRIUM classroom experience must end. At least that was the case before 2012. TRIUM’s Module 7—aptly named as the natural follow on to the program’s six modules—is an annual alumni-led event that brings together TRIUM alumni over a long weekend. They reconnect with one another and participate in business and political discussions with faculty from across the base of schools, and guest speakers—last year, in South Africa, they heard from the Zulu King! Previous destinations have included Rome, Washington DC, and New York. The inaugural Module 7 was set up and organized by class of 2011 graduate, Miguel de Almeida, in Cascais, Portugal.“The thinking behind it was that TRIUM is an intense program, […] and there’s a real camaraderie, and that’s something you want to carry on!” he says. Since its creation, Miguel says he’s been enriched by Module 7, grown his knowledge, and built stronger ties with the TRIUM alumni network. The first event in Cascais was given immense credibility by the calibre of the speakers. Miguel says LSE’s Michael Cox, professor of international relations, and Saul Estrin, professor of management economics and strategy, have a lot to be thanked for. This year—on the theme of the future of business—boasted professor of economics and international business at NYU Stern, Nouriel Roubini. The CEO of art business Christie’s Americas, Marc Porter, was also one of the guest speakers, and he was joined by the CEO of Best Buy, Hubert Joly, who has recently been ranked among the top 30 CEOs in the world by Barons magazine. Miguel says what makes the success of Module 7 so sweet is that he was initially told it wouldn’t be possible to pull off. But the commitment of the TRIUM team, alongside peers like Reuven Hahn, who Miguel says jumped on the bandwagon after the first event, helped get it off the ground. The beauty of the TRIUM Global Executive MBA Module 7 event is that it brings together alumni who've been present from the start. She used to be an anchor on French television, and so landed on the program with a background in international politics, and an understanding of economics. Module 7, then, seems tailor-made for her. That’s the TRIUM spirit, she adds. Graduates of the TRIUM program are lucky to have the full diversity of the world in their alumni network. Most stay involved with the program, Florence explains. She served on the board after finishing and was part of the jury for the program’s Capstone business project module. The power of the program, she asserts, is to prepare you for the future of business. Florence launched her own fashion brand, ALEXIA KLEIN, in 2014 in New York. The rise of e-commerce, especially Amazon she says, means that everything has changed within the retail and fashion industries. The TRIUM Global Executive MBA taught her to adapt. After the financial crisis, she adds, they had to change to become entrepreneurs more than corporate figureheads. Now, global business leaders have to adapt again, this time to maneuver the rise of blockchain, artificial intelligence, and machine learning. This year’s Module 7 allowed class of 2008 graduate, Mohammad Iqbal, to anticipate that same wave—it was the first he has attended. When he began the TRIUM program, he was working as a management consultant in Washington DC. Embarking on the program took him away from his US-only experience and allowed him to move into new markets and areas. He now works in Abu Dhabi, looking after the government performance from a strategic standpoint. From Module 7, he gleaned the state of the economy now, and what professors see as the big movements in the coming couple of years. He’s able to translate that knowledge into his work in the UAE. “When I see a big investment in a certain sector, I know what the risks are for the government of Abu Dhabi, how we might face them, and how we can draw up alternative plans to [tackle] them,” he explains. And his peers on the TRIUM Global Executive MBA?